The Naval Observatory sun azimuth table always calculates as North 360° minus sunset azimuth equals sunrise azimuth within a third of a degree, throughout the year. 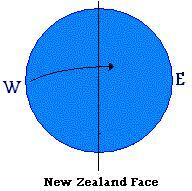 For example our local 21 June Solstice is listed as sunset 303.6°, sunrise as 56.5, so North 360°. minus 303.6 equals 56.4. Here in Saratoga Springs NY, the sun's [actual] azimuth at sunset 11 Apr. 06 was approx. 304°. 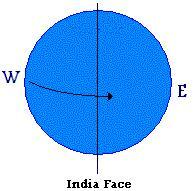 The sun's [actual] azimuth at sunrise was approx. 104°. Using the N.O. formula, North 360°. minus 304 should equal 56°. The actual calculation of 104° is a whopping 48° off! And the [actual] sunset azimuth today exceeds the government's own calculated azimuth more than nine weeks away! I simply used my Silva orienteering compass to get the approximate actual bearing for sunrise and set and compared them to the table calculated by the U.S. Naval Observatory website. Since early 2004, when the Earth was stopped in her orbit on Dec 25, 2003, Nancy and others have documented what we described as an Earth wobble or polar wobble. The wobble dynamic at that time was a grab or push on the highly magnetized hardened lava at the bottom of the Atlantic Rift in an S shape. The southern part of this S was grabbed as it rode into the dawn, pulled the Earth slightly askew. This tugging on the Atlantic Rift was also apparent in the global shakes or shuddering that occurs primarily at four times a day - when the Atlantic Rift either faced or was in opposition to Planet X, near the Sun, or at the dawn or dusk point when it was failing to come into magnetic compliance with Planet X. Magnets want to be either side-by-side of end-to-end, not bowed to the side. There was no other explanation for the periodic global shuddering other than tugging and pushing by Planet X, which accounts for this phenomena being utterly ignored by the USGS. They say nothing, as saying anything brings attention to the phenomena, and no argument they can muster can explain it. As Planet X moved closer to Earth, during its steady passage, it also began to push on the Earth's N Pole, accentuating the wobble into what we called the polar wobble. Magnetic particles emerge from the N Pole of Planet X, like a hose, and the N Pole of Earth tries to evade this hose by tipping its N Pole away. As the magnetic N Pole of Earth is not aligned with its geographic N Pole, the magnetic N Pole of Earth at times was hidden over the horizon, at times pointed toward Planet X, thus creating the wobble in the form of a Figure 8. 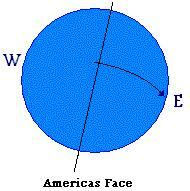 For the N American continent, the Figure 8 causes the sunrise to be higher and the sunset lower than normal. For Europe, this causes the sunrise to be lower and the sunset higher than normal, with the East Coast, as the report shows, seeing this skew at sunrise. 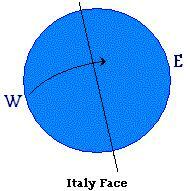 The Navy cannot align their Azimuth tables to show this without being patently obvious. As has been pointed out to Nancy by an astute and observant fan, for N America, any adjustment of the Navy tables would show a skew of so many degrees from normal this would be noted! It flies in the face of calculations astronomers, and amateur astronomers, use. But the public is documenting the wobble which Nancy and friends carefully documented during 2004 and into 2005, the wobble which continues today. continue to claim all is normal and stick to the old charts. adjust the charts to reflect reality. If they claim all is normal, astronomers and observatories are deluged with calls from the public asserting the sun is not where it should be, and where this changes the timing of sunrise and sunset, the weatherman and papers reporting this data get deluged with calls. All very noisy and tiring. If they adjust the charts to reflect reality, the calls stop, but the Navy data would lie there, waiting to be discovered by those who have observed the Earth wobble and are aware of our explanation of its cause. Cover-ups succeed when fewer individuals are in the know, and astronomers and observatories are already being included in the group in the know, as they observe and are aware of the presence of Planet X near the Sun, and are under hush orders in this regard. Thus, option 2 will increasingly look attractive to the Navy, who may long to adjust their charts to control the clamor from the public.